Even the most well-planned marketing campaign achieves lackluster results without the right audience. But what if the right audience can be warmed up to your message before they even see it? The term for this is called “Pre-Suasion” and was coined by Dr. Robert Cialdini who has written a book by the same name. It’s an obvious play on words (pre-sale and persuasion), but it’s so much more than that and the concept deserves a full post recap. Pre-Suasion: The Process of arranging for recipients to be receptive to a message before they encounter it. Strategically guiding preliminary attention to move prospects into an agreement with the marketing message before they ever experience it. Believe it or not, people are being “arranged” toward your message. Pre-suasion happens, whether you’re in control of it or not. If marketers understand this concept and use it to prepare prospects—any marketing strategy will be more effective. Dr. Cialdini uses a farming analogy and there really isn’t a better one. Imagine throwing the best seed onto any old ground. It’s only going to grow if the soil is good enough to yield nutrients. Even still, the better the soil, the better the crop. No matter what soil you start with, you can work the ground to prepare the soil for planting. If the seed is your marketing campaign, the soil is the audience that will hear and see it. Make sense? If so, keep reading. I’m breaking down all 30 principles of Pre-Suasion to help break up that hard rocky audience and get it ready to plant your message. Before you ever ask for anything, it’s better that your audience of leads trust you. Creating and establishing this trust is a matter of conveying information in a way that seems like it’s in the best interest of the recipient, not the business (i.e. you). Example: A fantastic look at this is Chubbies Shorts. They put out amazingly fun content that genuinely helps their audience enjoy summer. Their tutorial of how to build a pool for under $100 has 1.5 million FB shares. Pretty sure, Chubbies is selling some board shorts from that traffic, even though it doesn’t even require an opt-in. We all know that your call-to-action has to be clear and concise. But fewer people know that the better you focus your audience’s’ attention, the better the results you’re likely to see. Having the core elements you’d like viewers/leads/traffic to focus on and delivering it in a way that draws their attention. Example: Whenever you go to a concert or event, there is always video footage before the main event. Selling merch, introducing speakers, you name it. When people are waiting for the main event, it’s easy to get them focused on specific things that will be addressed. If it’s on the page, in the video, or in the email — it’s significant. Sure, it may not be a button or copy, but every element of your message should be intentional and have some thought put into it. Things that affect page-speed, background images, or even sound can all distract from or enhance your marketing. When you’re talking about what you (or your products) do best, don’t mention the competition. Occasionally, the chart that shows your features compared to your competitors is necessary, but not in the pre-suasion phase. The positive features should be communicated in a way that establishes trust. Mentioning competition early on is like a novel including a list of books just like it on the back cover instead of influencer reviews and a blurb about the author. Ok, let’s take a look at two quick scenarios. A small documentary-style case study showing your user engaging the product and then tell exactly how they went from where they were to where they are using your product. The footage of the product being used before the testimonial and facts are heard causes the focus to be on your product—associating the thing you’re selling with the success. With our first example, your leads are disconnected from the product being the cause of the success. We shouldn’t be talking to an audience to describe a product. Instead, we should be communicating to influence our leads. Being able to influence leads to perceive your product as a solution well before your pitch is the best way to hit “shut up and take my money” level at some point in the sales cycle. How To: Use words and images that speak to the audience you’re trying to influence. Obviously firmographic, psychographic, and demographic data would come into play for maximum impact. It helps us file things away in our mind without fully having to understand them. This is also why PR and sales folks have to constantly change and define new terms. For instance, people don’t like the word “liberal”, let’s try “progressive”. Not down with “global warming”? How about “climate change”. It’s not “used”, but “like-new” or “gently pre-owned”. Find that lingo and reinforce positive associations while avoiding negative associations. When you’re baking a cake, you should sift the flour. If you don’t, you may end up with big chunks of chalky mess. Smooth batter is a better eating experience. Your copy, sales presentations, and webinars are a lot like cake. They have to come across as pleasant and be easy to digest. Make sure you’re taking out any fifty cent words that aren’t absolutely necessary. IF they are needed, make sure to give the layman’s definition whenever possible. Metaphors are no joke. This tool is powerful in pre-suasion (and plain ole persuasion). You may have noticed, but I used a little bit of this one in number 8. Feel free to go back and take a look at the cake analogy (an analogy is one of the seven types of metaphor). There is no substitute for getting a message across to an audience in a way that is memorable and builds trust. Sure, they aren’t always useful (on page copy would be one example). But webinars, live demos, and just about any audible presentation are prime metaphorical territory. Everyone wants to hear about themselves, how they’re smart, useful, getting the best. If you want people to be “pre-suaded” for your marketing message, make sure you’re talking about them—implicitly. Use the words (you, your, you will, etc.) in a way that makes it clear who’s benefiting, but not in a way that’s just “blowing smoke”. Even the questions you ask have to be skewed toward positive statements. Being neutral or negative doesn’t get the brain juices flowing in your direction. Open-ended questions like: “How likely are you to X?” or “Are you dissatisfied with your current solution?” can easily get people in a raw or indecisive mood. How important is it to your organization to improve [benefit of your product]? What would it do if you could free up [resource] and use it for more [benefit]? A lot of the techniques of pre-suasion deal with common sense things that few take the time to think about. All of the elements have to not only have a purpose but also make sense. Example: If you’re selling an AARP membership, you’re not going to have a kid from the Disney channel hawking it. You’ll get a major actor for the Boomer/Gen X generation. That just makes sense, right? Make sure your elements line up to stimulate the correct response. Making your competition seem as mundane and “behind the times” as possible is usually a helpful tactic (especially in tech). Highlight your biggest competitor and showcase their features alongside the exact same features of all of the other guys in the category. Doing this will help your unique value and features shine like a diamond on a black cloth. Arguing with your audience is never a good idea. That said, arguing against yourself can work wonders. hey have reservations, which end up in arguments as to why they shouldn’t buy. Mentioning these potential objections in a fair manner and refuting them with sound logic builds credibility. Example: “Most [product type] take a decent amount of time to implement and learn, making it difficult to do properly. We’ve all had that experience in the past. But [explain how your product is different]. Whether or not they’re good at it, people love ticking off boxes from their to-do lists. Splitting long processes up into sections that give a sense of accomplishment, or simply adding a progress bar to you opt-ins can help improve your conversions at the start. Splitting long processes up into sections that give a sense of accomplishment, or simply adding a progress bar to you opt-ins can help improve your conversions at the start. Make it known, make it easy, make it short. You remember the Adam West Batman? This technique, like most powerful tools, can backfire. But there’s nothing wrong with doing an email that entices an audience to click through, or doing a multi-series blog post that is back loaded with extreme value. You can make anything more mysterious—just ask JJ Abrams. The more you entice with mystery, the more your audience will stick it out. Of course, there has to be a payoff at some point. If the guy and girl from your favorite show never get together, you stop watching eventually. I’ll even give you an example of what you’d think would be a difficult product. Example: Do you actually know how the most popular and common toilet paper brands are made? We made a video about it here. I linked to a “how it’s made” post (you probably know that by now ;). But you could totally link to your video explaining how the average batch of TP is made with 10,000 gallons of chemicals. If you make a non-toxic wipe, easy peasy sale. Everyone knows someone who is just instantly loveable. Using these tricks does this with your brand. You can take that likeability and really drive it home through the language you use. If you name your products, groups, etc. with familial labels, your leads and customers will feel a closer connection. Ford, George Foreman, Clark Bars, Walmart. All named after someone and have staying power. Sure, over time they become large heartless corporations, but all had a time where the person worked there and was (typically) well received. If Sister Act taught us anything, it’s that getting people to do something together (like sing) will help get them to work together and be more loyal. Example: If you’re ready to [benefit of your product], give me a “heck yes” in the Facebook group right now. If your leads drag someone else off the couch into the conversation, they are now in league with you. They’ll defend and sell your products from an angle you don’t have—friendship. Using the example from #19, why not try and get them to tag their friends and get them onto your live videos? Boom! Engagement, engagement, engagement! Get likes, shares, comments, and the like in order to sell more. But what about them (your audience/leads)? “Liking” should be a two-way street. Telling prospects how you feel about them is important. Whether it’s talking to individuals in your videos, mentioning why you love [target market roles], or just celebrating their attributes (pertaining to your products). Go ahead and like them back. Amazon dominates e-commerce. They’re pretty much competing with themselves at this point. This is good news because we can all improve using their vast experimentation. What’s the future of your funnel look like? Things like “customers also bought”, “most popular”, or “Jane Doe just purchased XYZ 15 minutes ago”. Call your developer, this one works or else the Bezos wouldn’t be doing it. The Message: What you’re saying has to be well-crafted, compelling, and involves some psychology. The Medium: Using video, web copy, or audio all need to be well thought-out, high-quality, and popular amongst your target demographic. The Messenger: This goes back to number 12. Make sure the person doing the talking knows what they’re talking about and looks the part (if necessary). Urgency and scarcity are a one-two punch for marketers when done properly. Software startups can do this every so often in the early stages to stimulate growth. When you stair-step up your pricing, you’ll gain a lot of momentum by advertising the change. If you started out as free, but are doing away with the freemium model, you can explode growth. Make sure you publicize your pricing change, deal expiration, or other scarcity tactics wisely. Don’t overdo it. Marketers don’t like freeloaders—they LOVE them! Why? Because most people hate being a freeloader. Sure there are always people who just in it to get something for free. But even if it’s most of your audience, the ones who purchase more than make up for it. Give them something incredible, unexpected and tailored to them. In a word valuable. Expect nothing, but give an opportunity to show gratitude. Everyone feels like a walking mess sometimes, but we all like to think of ourselves as consistent. Making a commitment or a public stance on a product/service makes your leads/customers bring something that puts their credibility on the line (either publically or even in their own mind). Insurance sales is the industry that does this the best. Immediately your mind floods with what will my spouse do, or my kids. I may have just sold a policy for some agent out there, just by getting you to think about it for a second. It’s that powerful. But, when laying out the consequences of passing you by, always give legitimate steps to avoid the problems—even if they don’t use you. This is the right thing to do and it builds credibility instead of making them think you’re too sales-y. Anything you put out should be as long as you can hold the attention of who you’re making it for. We’ve all started a YouTube video and found the ad so enthralling that we forgot what we originally wanted to watch. We’ve all started a YouTube video and found the ad so enthralling that we forgot what we originally wanted to watch. Example: The best I’ve seen are those recipe ads. Someone selling mayo will give a recipe using their product. People stay for the whole thing and then go to the grocery and pick up a jar. They aren’t short but still keep attention. Most storytelling needs a little bit of “stage setting” in order to really draw people in. If you see the characters of a movie doing some seemingly mundane stuff at the beginning of a movie—you’re probably going to like the entire movie. You feel like you know the characters, which makes you pay more attention to the plot. Build the story around your message with details that complement said message. or instance, you’re in school and the fire alarm goes off. You are trained to walk, single file, out the door. The cue is the alarm, your environment changes and you react. 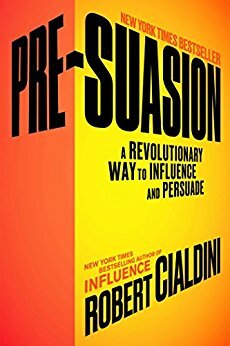 As always, the potential of “pre-suasion” is only realized as far as you implement it in your own marketing. Before an interaction, define what you choose to emphasize. Support these with a specific picture, a quote, an anecdote, or similar. You want to share something specific that will reflect your goal and resonate with each person involved. Ask clients for their advice rather than their opinion. Asking for their advice moves clients towards you psychologically. Asking for their opinion, moves them away. Identify commonalities up front with each involved individual in every project. Consider shared interests, origins, core values, locations, charitable organizations, and so on. Highlighting those commonalities will not only make other individuals feel closer to you – will also make you feel closer to them.